The guardian ad litem: A potted plant? A social worker/psychologist? A lawyer advocating for children’s wishes, or the children’s best interests, or both? Much ink has been spilled over the GAL’s role, and much real and virtual debate has taken place. This is the third in a series of articles discussing the role. In the first article in this series, I discussed a controversy between the ABA Family Law Section and Litigation Section over model rules for a GAL proposed by the National Conference of Uniform State Laws Commission (NCUSSL). In the second article, I discussed the role of the GAL in Wisconsin. In this article, I will discuss roles of lawyers for children other than the role prescribed in Wisconsin. The dispute between the Family Law and Litigation Section is whether a lawyer, when acting as counsel for the child’s best interests, is acting in the role of an attorney. 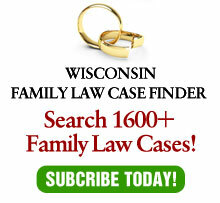 In many respects in Wisconsin, as discussed last week, since the GAL represents the “concept” of the best interests of the child, instead representing a client, the GAL is acting more as a social worker or a psychologist – roles for which a lawyer is usually ill-prepared to perform. But Wisconsin’s role is by no means the only one for a lawyer representing children and maybe not even the ideal one. The American Academy of Matrimonial Lawyers, for example, adopted a model rule which would not allow the GAL to make a recommendation to the court, based on a belief that such a role would be inconsistent with a lawyer’s professional training. The AAML proposed role allows the GAL only to call and cross-examine witnesses. The effect would be to make the GAL little more than a potted plant when it comes to protecting children. Instead of helping to resolve custody cases by making recommendations, the AAML model rule would encourage litigation, as that would be the only means to get information before the court. Where a child does wish to express a preference, it may not be a wise choice. Some children may prefer a parent with less rules and discipline. Other children may be subject to bribery in the form of gifts or even cash (as happened in one case where I served as GAL). Given the link between child support and placement time, the temptation for a parent to campaign for a child’s preference will always be present. Some states have a hybrid between a best interests attorney and advocacy counsel. In California, for example, a “minor’s counsel” must usually inform the court of the child’s wishes, but does not necessarily have to advocate for them. The statute does not specifically authorize minor’s counsel to advocate for best wishes, but most will inform the court of their recommendation, anyway. Then, there are some jurisdictions that provide neither advocacy nor best interests counsel. In the worst of all possible worlds, there is no one in court specifically charged with protecting the interests of the child. None of these approaches are perfect. Therefore, in the last article, I will suggest what role might be served by counsel for children in my view of a perfect world.